The inheritance takes effect when executing a targeted setuid binary which was set for that purpose prior to execution. The important thing to understand is that you do not need to modify the original suid file in order to target it. 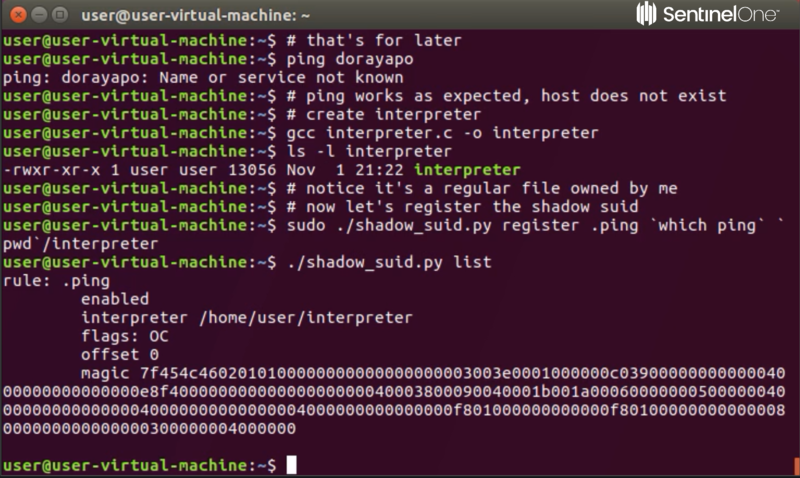 In order to make a Shadow suid, all you need is at least one suid binary on the machine, no matter what it does. For more technical details, see our forthcoming post Shadow SUID for Privilege Persistence: Part 2 (coming soon). With the new Linux agent (v2.6 SP2), you are fully protected from Shadow SUID execution. The agent constantly monitors any process execution and once a Shadow SUID is detected, the process is blocked, so damage is prevented. Moreover, since the agent knows exactly how the operating system works, users are able to see the attack storyline behind the execution and understand how the infection came about.